TOKYO, Japan -- The final day of the 85th Intercity Baseball Tournament at the Tokyo Dome on July 29, 2014 was graced by the historical visit of the Imperial Couple. Emperor Akihito (80) also visited the 30th Tournament in 1959 when he was Prince to watch semifinals between Kurashiki Rayon (Okayama) and Daishowa Paper (Yoshiwara) at the Korakuen Stadium, the predecessor of the Tokyo Dome. However, this was the first time for Her Majesty, Michiko (79) to make an official visit at the ballpark. The Japanese monarchy, the oldest continuous hereditary monarchy in the world, are involved in promoting youth and recreational sports by presenting trophies and attending games. 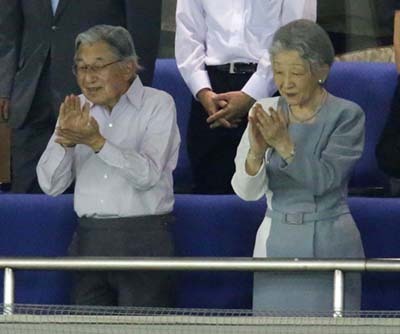 The Imperial Couple made the appearance from the Royal Box behind the plate on 3rd floor of Tokyo Dome just before the start of the sixth inning. The Royal visit was to the immense delight of 30,000 spectators, who together with His and Her Royal Majesties, enjoyed not only a thrilling pitcher’s duel, but also colorful non-stop cheers of enthusiam, passion and support for the teams. During the contest, the Emperor asked an accompanying official from the Baseball Federation of Asia if curveballs were difficult to hit. The couple watched the game won by Seino Transport against Fuji Heavy Industry 2-0, and stayed until the presentation of Black Lion Flag at the closing ceremony. Intercity Baseball Tournament is jointly sponsored by Japan Amateur Baseball Association (JABA), an affiliate of Baseball Federation of Japan (BFJ) and The Mainichi Newspapers Co.
With Baseball/Softball's place in society as the most popular and celebrated sport in Japan, BFJ and Japan Softball Association are active and fully supporting the World Baseball Softball Confederation in efforts to return baseball and softball to the Olympics, possilby in time for the 2020 Tokyo Olympic Games. Support and hope continues to build amongst baseball and softball's more than 65 million international athletes at all levels of competition, and among stakeholders and the global fan base, for the bat-and-ball sports to be considered for possible Olympic Games inclusion by the IOC at a special Session in Monaco that will discuss new options for the Olympic Games sport selection process in December. The 12-day InterCity tournament attracted over 500,000 fans who rooted for their favorite teams out of 34 from across the country. Seino Transportation will travel to Paris in September to participate in the “Yoshida Challenge”, an International baseball event in honor of Yoshio Yoshida who serves as International Baseball Ambassador of Olympic Reinstatement at the Templiers Senart facility just south of Paris. It will serve as European Championship preparation for the participating teams France, Netherlands and Belgium. Seino Transportation Co., a subsidiary of Seino Holdings Co., Ltd. (established in 1930) is headquartered in Ogaki City, Gifu Prefecture and started its baseball club in 1960. The runners-up, Fuji Heavy Industries (NASDAQOTH: FUJHY), the parent company of Subaru cars and, has its baseball club in Ota City, Gunma Prefecture since 1953.